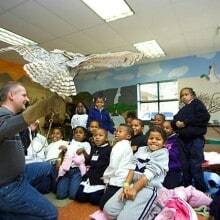 Help advance nature education at the Zoo. Children learn by interacting directly with nature. The zoo’s new Watershed Heroes project is specifically designed to inspire wonder of the natural world through hands on exploration. The Watershed Heroes project will give visitors an up close and personal experience with River otters, salmon, and Bald eagles, delivering conservation messages through creative and engaging experiences for all ages. Create a stream of knowledge. A new “Learning Lab” classroom with direct views into the salmon tank and eagle aviary will help meet the growing demand for nature education in our community. 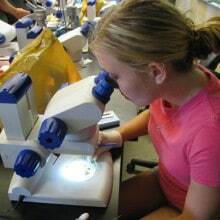 The lab will be equipped with kid-friendly microscopes that will empower students to study water samples collected from our local rivers and creeks. This kind of hands-on learning experience will help students to connect the health of our watersheds with the lives of the otters, salmon, eagles, and other animals that share it with us. 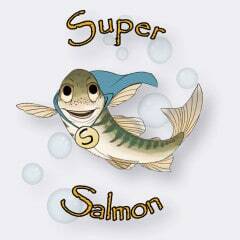 The journey through the new exhibits will end at the Watershed Heroes Headquarters, where Super Salmon will invite children and adults to become watershed heroes themselves. Interactive games will challenge visitors to identify signs of watershed problems and explain how they can help keep watersheds healthy. This unique experience will make the zoo a leader in the field of nature education on the North Coast. With your help, we will maximize the full potential of this project and our unique setting for experiential learning. In order to complete the entire project on schedule by this summer, we need your support. Make a generous gift to support the Watershed Heroes project before the year-end. Please consider your gift and then give a little more this year. Every dollar counts. Your gift will help provide education and direct experience with wildlife to over 20,000 school-aged children every year and make lasting memories with the zoo’s 70,000+ annual visitors. In the spirit of giving and thanks, THANK YOU for all that you do to support the zoo.